Solving multiple money funds in PortfolioCenter Let us manage the data, so you can manage the money. Q. Some of my PortfolioCenter Holdings reports display multiple line items for the money market (example above). The total of the dollar amount adds up to the total at my broker (Schwab), but the duplicate lines confuse clients and clutter reports. Do you know why this happens and how we can fix it? Sure do! Mutiple cash lines is a common problem and easily fixed. There are 3 common causes. 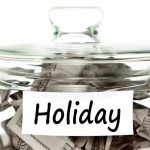 Typically, you see multiple cash funds on new accounts. The first few transactions often have the generic money fund symbol “CASH” while later transactions have the actual money fund symbol. This leaves money under two symbols. You may also see multiple cash funds in older portfolios. Until a few years ago, all cash transactions came with a generic cash symbol that could be overwritten by setting the default money fund in PortfolioCenter. Then as an enhancement, we begin receiving the actual symbol for the money market fund. This change left all cash up to that point under the old symbol and all new transactions using the new symbol. A third cause may be posting incorrect cash updates. In all cases, the total cash is correct (assuming your posting is accurate). This is just a symbol problem. To find problem accounts run the Global Money Balances report and look for duplicates. 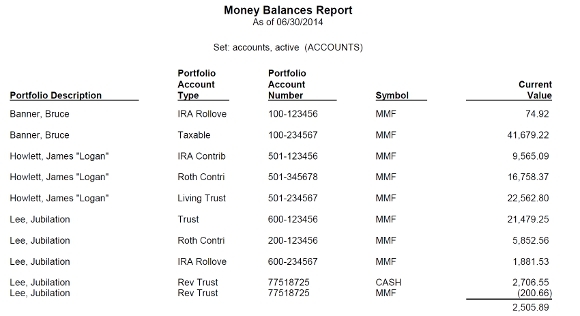 NOTE: Your Money Balances report may look different than my example below. I have modified the default settings to make the report easier to read and take less pages. For each affected account, go to the transaction ledger. You may want to sort by the ACCOUNT ID field to make it easier to find the problems. You can then either enter a Money Transfer transaction to move all cash in the wrong cash fund into the correct cash fund. Or you can manually change wrong symbol on each of the transactions. If there are only a few problem transactions, I prefer to edit them. If there are years of data with incorrect transaction, I use a money transfer on the date where the change occurred. To prevent future duplicates on reports, once a quarter or so (preferably just before running quarterly reports) run the Global Money Balances report and scan for duplicates.